Bring a timeless tradition to your family this year with these unique Woven Cross Kits. Although woven from modern materials, the technique taught in this kit works just as well with the fresh palm fronds we receive on Palm Sunday. 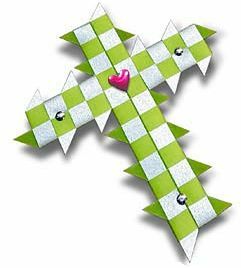 Each kit makes three green vellum crosses with silver accents. The finished crosses measure 3 ½" x 3" and make great bookmarks. The kit includes detailed instructions, pre-cut vellum strips, fushia metal hearts and silver "nail" studs.